Back in 2006 when I was a regular contributor to fieldhockeyforum.com a ‘newbie’ named Keely Dunn joined and posted about a defender positioned in front of the goal during a penalty corner and asserted in that post that such a defended caused danger and should be penalised if hit with an attacker’s shot at the goal. I posted a reply to that assertion in which I stated that the opposite was true – that a ball raised towards another player that endangered that other player was always, provided there was no intentional use of the body by the defender to stop or deflect the ball, the fault and responsibility of the player who raised the ball. Keely Dunn’s response was a tirade of more than a thousand words in which she declared that the fact that a defender positioned between a shooter and the goal demonstrated an intention to use the body to stop the ball and she then went on to describe her dedication to umpiring, her ambition (at the time to be an Olympic Umpire) and her hard work to that end. She finished her response by scolding me for “calling her out” and stated that if I ever did so again she would not respond – so this time I am perfectly safe from rebuke despite the fact that I am again going to disagree with her (declare that she is wrong) in the same way and for the same reasons. I will not accept that a defender is not allowed to defend the goal or to be in any position they need to be to do so. Below, in coloured text, is part of her analysis of the changes to the Rules of Hockey for 2019, in which she makes a similar claim to the one she made in 2006, concerning the protection offered under the Rules to a defender in front of the goal when a shot is made at the goal. That this is presented as a matter of safety is bizarre as there would seldom be any danger in such circumstances if the ball was not raised by a shooter directly towards a defender (a deflections towards a defender is rarely the result of raising the ball directly at that defender). In her defence I must point out that she has reversed the long-standing meme that an outrunning defender at a penalty corner who is attempting to tackle for the ball with his stick is committing an offence. (She does not now refer to such out-runners as ‘suicide runners‘, even though the UMB, scandalously, does). The reason for taking away a non-kitted player who can use their body inside the circle to play the ball is primarily safety. Watching a player without any real protective equipment throw themselves in front of a ball for club or country has become a Hunger Games-esque spectacle (for example, from the men’s World Cup, see the Blacksticks’ Bennett running down a Peillat drag flick, or England’s Gleghorne all but decapitating |Ireland’s O’Donoghue on the line at the end of their crossover match). The two clips below contain the incidents referred to in the above paragraph. I would not describe the PWGKP in the Ireland goal as a someone who had thrown himself into the path of a shot at the goal while aping the actions of a fully kitted goalkeeper, but rather as someone desperately trying to get out of the way of the ball because he believed he would be badly injured if hit with it. It is part of the training of goalkeepers to persuade them that a hit with the ball to the head when they are wearing a helmet is not life threatening (although there have been some nasty injuries caused to goalkeepers by the failure of a sub-standard helmet or a previously weakened eye-grill) and get them to use the helmet to deflect the ball. This training is not easy as it is counter-intuitive to most people, and it can be no surprise that a field-player who has not been properly trained as a goalkeeper should react as if his head was not protected with a helmet. (Injuries to the side of the head, including fractures of the skull, are not uncommon in defenders wearing face masks, who turn their face away from an incoming ball; overcoming the instinct to avert the face is not an easy task – the injury to Godfrey Irwin in the EHL comes to mind). The Rule which penalises the raising of the ball into an outrunning defender during a penalty corner is a near copy of the part of the Explanation of application of Rule 9.9. concerning the raising of a ball towards an opponent – but there are critical differences. At lower levels, the benefit to pulling the goalkeeper is still too often an exercise in futility where a hapless defender stands on the penalty spot wearing a different—coloured shirt, terrified to leave and create the numerical advantage that is the sole benefit of the exercise. Teams are now constrained to using only all ﬁeld players to create the numerical advantage (or continue playing a match where a fully—kitted goalkeeper is unavailable). It doesn’t change the fact that we have unprotected players running around in the circle, but hopefully, there will be less incentive for anyone brave soul to sacrifice their limbs for goal-saving glory. I nominate this the rule Most Likely To Be Forgotten It Was Ever Different When The Next Rule Book Comes Out. Way less to remember. There are no fewer than 24 instances (yes, I counted them because I’m a giver that way) in the rule book where a PWGKP was specified in addition to the goalkeeper and those are now all gone. No more arguing about putting on helmets, whether they can wear the goalkeeper’s blockers on penalty corners, or reminding attackers that YES THEY CAN USE THEIR FEET, PLEASE JUST PLAY ON NOW CHEERS. However, you’re likely going to have more situations where you have difficult decisions to make regarding dangerous play, i.e. when attackers shoot at goal with field players in the way. You’ll need to continue to keep in mind the idea that defenders who are standing in front of the goal doing their best Maddie Hinch are choosing to put themselves in danger (and really need to stop that, m’kay?). No not m’kay or okay, what criteria are going to be used? An attacker who chooses to raise the ball at an opponent in a way that endangers that opponent (forces self-defence for example), chooses to commit a foul and should be penalised. A player who carelessly or recklessly raises the ball towards another player (I believe the change to “opponent” to be a mistake – the emphasis should be on the safety of all players – hospital emergency rooms will not made a distinction between injured same team or opposing team players) commits an offence and should be penalised. Defenders who are marking, intercepting, closing down the ball or otherwise making an attempt to tackle are NOT putting themselves in danger and need to be protected. Of course they are putting themselves in danger, given the present penalty-corner set up they have no choice but to do so. Anything which facilitates the near immediate making of a shot at the goal will be stupidly dangerous to defenders trying to prevent that shot and having to run 13m or 14m towards opponents to do so, especially with the present attitude towards a ball raised towards a defender – even if it is only allowed below knee height when the opponent is within 5m. The penalty-corner needs to be replaced with a power-play conducted in the opponent’s 23m area and the necessary ‘charge’ eliminated. I don’t hate this change. Simple is usually better, and safety (when real and not imagined) is no one’s enemy. it’ll also make teams more cautious when pulling their goalkeeper. But when they do, they’ll go for goal with more rigour, making for more exciting, attacking hockey at the right moments. I very much doubt what is written in the last sentence. Attackers will still back into opponents, spin and ‘look for a foot’, at present they are given, because of ‘umpiring practice’, no reason not to. The above clip is an excellent example of the degrading of Rule to the point where it is applied in the opposite way to that which it was obviously intended it be applied. Any forcing action is still supposed to be dealt with (penalised) under “other Rules”. What other Rules if the ball is not raised? Your guess would be welcome. The ARG player who makes a tackle and gets possession of the ball has several options immediately available to him but realizes what the team needs most is time to position to take advantage of their possession of the ball – they are grouped and still recovering from the chase-back to retrieve the ball from their opponents and are not ideally placed to exploit possession. So what does he do? He decides to ‘win’ a free ball. He has no hesitation in raising the ball and aiming it into the legs of the NZ player (contrary to what is given with Rule 9.9), who is attempting to position to tackle him because he fully expects the umpires to ignore this foul and to penalise the player hit with the ball. As it happened the NZ player intercepted the ball with his stick, but the ARG player appealed for a contact offence anyway, possibly hoping that the umpire was too far away to be certain of what actually happened (the umpire was still recovering from his move to the baseline in anticipation of an NZ attack, but must have seen that the ball was raised from close range into the NZ player? No?) The umpire followed expectation following the claimed contact and the ARG player got away with this blatant cheating. This raises the matter of the positioning of umpires and the number of officials on the pitch. I think, at this level, there should be five officials. Four flag officials running the arcs between the half-line and the goal-posts, each responsible for one side of a single half of the pitch, with some overlap around the half-way line, and an umpire in the center between the circles running the diagonals between the widths of the circles. In that way almost all incidents on the pitch should be supervised by at least two close officials and often by three. Should anyone think this number excessive they should consider that a top level tennis match is supervised by twelve officials and the playing area is a fraction of that used to play a hockey match. I view the shot at the head of the IRE PWGKP when there was nobody guarding the left post and therefore much of the left side of the goal, as cheating i.e. as deliberate dangerous play. In my view the (highly skilled) shooter deliberately targeted the defender knowing the defender would not be able to adequately defend himself. A risible comment? If you like, but there are no ‘sour grapes’ a 3-2 loss is as much a loss as a 4-2 loss. There can be no doubt (the opinion of Keely Dunn aside) that the shot was dangerous play by the shooter and it was played where it was played deliberately. A small risk as ENG were winning anyway, but maybe he thought a shot wide of the defender would be more easily saved. There was nobody doing “a Maddie Hitch impression”, there was desperate evasive action, which in the circumstances was, I believe, legitimate. That shot would have been saved easily by a competent goalkeeper but a PWGKP, wearing only a helmet for additional protection, stood very little chance of stopping it. The Einstellung Effect is a tendency to continue to think in a way that is being used (on a present problem) or has previously been used in making judgements and decisions, which can lead to blocking of relevant though and therefore to less-than-optimal decisions or judgments. That is answers or decisions that are incomplete or incorrect. The effect can be the culprit in failure to find optimal and/or simpler solutions to new problems when we see features of a problem that reminds us of similar problems we’ve solved in the past, (or seen others solve in a particular way). The first solutions that come to mind (to put it mildly) tend to follow similar lines to those past solutions/decisions. Those first ideas often get in the way of (block) the finding of better solutions or the making of correct decisions because they prime us to think in a certain way. Cognitive traps like this may be the result of our natural desire to simplify the way we process information since simplification saves mental energy. Our minds are cognitive misers, using shortcuts to save cognitive power whenever the opportunity arises (we are naturally lazy or ‘economical’ with effort). An example from the 2018 World Cup. We can fall prey to the Einstellung Effect whether we’re novices or masters in any problem-solving arena (but you have been warned so may not immediately do so here). Here are two examples of problems where difficulty with the Eintellung Effect is possible. The first has often been solved by young children in less than 20 seconds but has still completely baffled their teachers. Be warned there is some misdirection in the following puzzle. The following clip labours the text of the Rule and suggests improvements to it. I am not convinced that the umpire was even watching, and saw this incident, as he struggled to get back into a position in the circle. His failure to penalise for obstruction and physical contact (backing in and barging) is otherwise inexplicable (a goal was awarded). The incident in the video is about whether or not there was a ball-foot contact by the defending player but, perhaps more importantly, what the umpires should have done if they believed there had been a ball-foot contact. The fact of contact (once established) is not the end of the matter, it is not what penalty is based upon because it is not what offence is based on. if there is ball-foot contact a reasoning process must take place before a decision may be made. The Rule Explanation is absolutely clear on this point. So was there either intent to use the body to stop or deflect the ball or an advantage gained from doing so? I think that intent by the defender to use his body can be dismissed as he is clearly trying to play at the ball with his stick and besides that, at that range he did not have time to move into the path of the ball even if he had guessed what that path would be. So advantaged gained? The ball clearly went out of play over the base-line before anyone else from either side could play it; but did it go out of play off the defender? If yes, then the defender disadvantaged his own team as a result of this contact because the umpire would have been obliged (following proper reasoning ) to award a restart to opponents on the 23m line (not a 15m to the defenders) – so no advantage gained therefore no offence. If not, then the correct decision is the one the umpire initially made, a 15m ball for the defending team. Enter the support umpire. He believes he saw a ball-foot contact by the defender and indicates for a penalty corner. Why? Why he though he had a superior view of the incident compared to the view of it his colleague in the circle had from close range, is a mystery, but his reasoning should have been no different to that of the umpire in the circle – Assuming contact, was there either intent or advantage gained? – His signal if he thought he saw contact (but no deflection of the ball away from the goal, which there clearly was not) should have been for the award of a restart on the 23m line (one arm pointing in the direction of the base-line?) He had no grounds for recommending any other decision. “The player only commits an offence if they gain an advantage or if they position themselves with the intention of stopping the ball in this way“. The Rule Explanation statement above is something that does not appear to be generally known, or if known not understood, or if known and understood (as is claimed by all umpires), simply ignored by most umpires. Why? It is amazes me what is now seen as acceptable, even good, umpiring following the ‘interpretation slide’ that occurred after the introduction of the receiving exception to the Obstruction Rule (1993) and the deletion of the Forcing Rule (2011). Umpiring practice has led to hardly any penalising of obstruction (and some incorrect penalising for it when it does not occur) and also, in the other direction, the penalising of nearly all ball-body contact, instead of there being hardly any interruption due to ball-body contact. It is strange that ‘interpretation’ has almost inverted the proper application of both of these Rules. The hitting of the ball at maximum power into the feet or legs of a close and/or closing opponent has never been adequately dealt with. The general attitude to this action seems to be that it is the defender’s (tackler’s) fault for getting in the way – and getting hit in such circumstances is an acceptable and accepted risk – tough players just rub the pain away and get on with the game (but a young novice who is subjected to this sort of treatment might well give up on hockey and instead play, the less painful and more reasonable, soccer – soccer is a contact sport but a player is not allowed to prevent a tackle by giving an opponent a kick in the shin, an action which would be about as painful as being hit with a hockey ball above the shin-pad or on an ankle). I take the view that unnecessarily (avoidably and often intentionally) hitting the ball at high velocity into the feet/legs of an opponent who is attempting to position to make a tackle is not responsible play, even when taking a shot towards the opponents goal – it is irresponsible (because it frequently causes injury and almost always causes considerable pain to the player hit) and is therefore reckless play. I believe this action ought to be penalised as a forcing offence. Obviously it is easier just to ‘blast’ the ball through an opponent rather than evading a tackle attempt and then resetting to strike the ball, that takes some skill, but hockey is supposed to be a game of skill. The easy shove of the ball into an opponent’s planted foot when they reach for the ball with their stick is simply laziness and should not be rewarded with penalty. In most instances of “finding a foot” (how forgiving of what is cheating that phrase is) there is no good reason for the umpire to intervene and play should just continue. One of the five video referrals from the same match. My apologies for the up and down quality of the voice commentary on the videos. I have taken down my article Advantage and Misunderstanding, because I made the assertion in it that it is not possible to allow advantage to be played unless there has been an offence by an opponent (which was at one time undoubtedly true, but is probably not true now or not demonstrably so). I can’t now argue (given the wording of Rule Proper 9.11) that advantage cannot be allowed to an opponent of a player following that player’s breach of Rule 9.11 when it is not an offence – although I would like to. What I need to argue is that there should be no distinction made between a breach of Rule and an offence – the criteria should be the same – creating a distinction between a breach and an offence merely created more confusion in two, already confused, groups of participants. When neither of the current criteria for offence are met during a ball-body contact there should be no violation called and play should just continue (but, I would change the criteria for offence to something very different, see suggested Rule rewrite link below). I think it absurd that defenders are often more focused on avoiding being hit with the ball (because they are usually penalised for being hit) than they are on making a tackle for the ball, and attackers are often more focused on winning a penalty corner by ‘attacking’ with the ball the legs of a defender (which should be a foul), than they are on trying to make space for a clear shot or pass. The alternative tactic to shoot towards the goal (usually at maximum power and with a raised ball irrespective of the positioning of defenders, in the expectation that if a defender ‘in the way’ is hit with the ball that defender will always be penalised), makes a nonsense of the Dangerous Play Rule and the supposed “Emphasis on safety”. I am not happy that Rule 9.11 ball-body contact and the Explanation of Application given with it create a difference between a breach of Rule and an offence which applies in only this Rule, nor am I content with the wording of the disruptive advice in Umpiring 2.2a because it make a nonsense of the Advantage Rule. Umpiring 2.2a it is not necessary for every offence to be penalised when no benefit is gained by the offender; etc. I need to think some more about the Advantage Rule (12.1) aspect of this problem but my belief is that a return to the previous clarity of offence and no offence would aid understanding and correct application of both Rule 9.11 and Rule 12.1. This would require a realignment of the Rule Proper and Explanation of Application within Rule 9.11 ball body contact, so that they are not conflicting, but supporting statements: in fact the Rule Proper needs to contain the criteria presently given in the Explanation of Application. Both the present criteria for offence have at one time or another been written into the Rule Proper and there is no good reason why they should not now be both included at the same time. Field players must not intentionally or in a way that gives an unfair advantage to themselves or their team, stop, deflect, propel, kick, pick up, throw or carry the ball with any part of their body. I have some upsetting ideas for those simple people, in a suggested rewrite of Rule 9.11 (link below). Rule 9.11 Ball-body contact and the related advice from the 2017 Umpire Manager’s Briefing in shouting size with colour highlights. The above Rule is very simple and the Explanation about how it is to be applied is reasonably straightforward, ‘reasonable’ depending on what is interpreted to be an advantage. So why is the application of Rule 9.11 so abysmally badly carried out in practice? I think it indicative of the attitude taken to the Rules of Hockey by the Umpiring Committee that the text in the Rules is said, in the UMB, to reinforce the existing interpretation – instead of, as it should, declaring that the interpretation follows the text of the Rule and Explanation. Rules are not intended to reinforce interpretations that have arisen via umpire practice, umpires are supposed to be applying the Rules of Hockey, not making them, and the Explanation of application must, if there is to be consistency, be regarded as instruction, not just as advice or recommendation. But at least it is clearly stated in the UMB that the player only commits an offence if they gain advantage. Is that clear or does it in fact ‘plant’ the words “the player only commits an offence“? The above Rule Explanation, if it is read at all, appears to be ‘skimmed’ and applied as follows. It is always an offence if the ball hits the foot of a field player. The player commits an offence if they stop the ball with their body. The UMB leaves out the criterion of intentional ball-body contact, as well it might even if that should not have been left out, intentional ball-body (ball-foot) contact occurs about once in a thousand instances of such contact, if that. The gaining of an advantage following a ball body contact occurs in possibly 50% of instances but probably far less than that as the player is usually occupied trying to avoid being hit with the ball and if the player is hit the ball can rebound in any direction. Which team benefits is generally similar to the result of a coin toss, but it may be neither team, the ball might just run loose so that it can be evenly contested for. But a player who has been hit with the ball is penalised for ball-body contact in at least 95% of instances. If, as seems to be the case, umpire coaches are striving to “take the whistle out of the game”, penalising ball-body contact only when it ought to be penalised would be an excellent way to achieve that aim. Here (video below) is an example of an umpire, during the 2017 Women’s European Cup Final, BEL v NED, accepting a video referral from the NED team claiming a ball-foot contact. I suppose that, because the match umpire obviously could not make these judgements, not having seen the incident, intent to make contact or advantage gained from doing so would have to have been left to the judgement of the video umpire, even though video umpires are not supposed to make these subjective judgements (see Tournament Regs. Appendix 15) – but only to make recommendation to the match umpire based on what is seen – which seems to me to be a contradiction which places both the match umpire and the video umpire in an impossible position: but on we go. The BEL goalkeeper deflects the ball with her stick onto the foot of a defender positioned very close to her. This was an unintentional contact by the BEL defender, she could not avoid being hit. The ball then deflects away from the hit defender, was missed by a NED attacker – who immediately ran to the umpire to request a video referral – the ball then continues into the possession of another NED attacker without a BEL player being able to gain possession of it. The NED player then in possession passed the ball to a team-mate and an attack on the BEL goal proceeded, but was halted by the umpire who had stopped time for the video referral. Naturally the video umpire confirmed there was a ball-foot contact and a penalty corner was ‘automatically’ awarded. What happened in this incident is pretty much the standard ignoring of the Explanation of Application given with Rule 9.11. thereby ignoring the criteria for a ball body contact offence to have occurred. The BEL team gained no advantage from the contact, on the contrary, if the ball-foot contact had not occurred the ball deflected by the goalkeeper would I believe have run to another BEL player further away from her and not into the possession of the NED player it was deflected towards off the BEL defender. That could have been ascertained in less than three seconds following the contact. The umpire could correctly have penalised the ball shielding of the NED right flank player prior to her passing the ball into the goalmouth, a pass which led to the goalkeeper deflecting the ball away from the goal-line. But ignoring ball shielding is also pretty much standard practice – which is why ball shielding at every opportunity is standard practice for players. This is an area where the whistle really has been taken out of the game – almost completely. Is there something beyond the reach of translation or beyond literal interpretation of word meaning in the text of Rule 9.11 and the Explanation provided with it? Are the words ‘only’ and ‘if’ being made to do too much work? Could the Rule be reworded so that it ceases to be so badly applied? 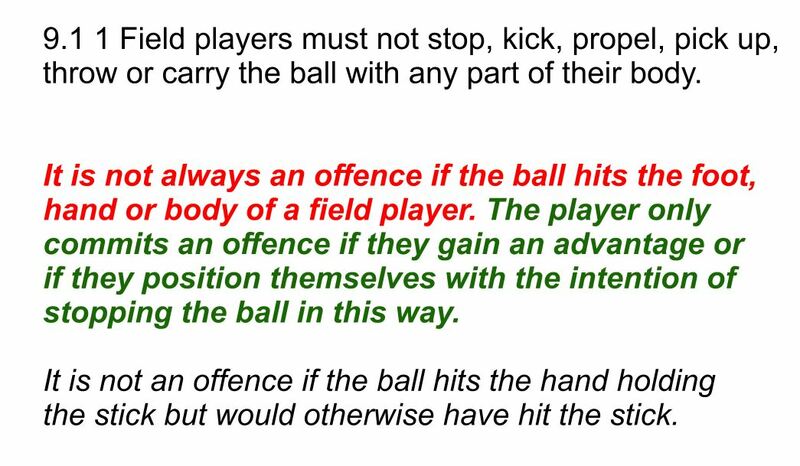 How about Ball-body contact is not an offence unless the player hit with the ball…. But I think not, almost everything, including various rewording of the same criteria, has already been tried without making any difference whatsoever to ‘practice’. “Ball-body (foot) contact is an offence” is a meme, which umpires have been unable to get out of their heads for thirty or more years, despite the considerable efforts of the HRB and the FIH Rules Committee to get them to change that approach. It is a meme which will be heard repeated in every explanation of the Rules of Hockey offered by contributors to YouTube (including England Hockey), in many an International level player stands before the camera and informs viewers that this is a fact. This ‘fact’ was also contained in the video made by the FIH, to give an idea of the Rules of the game to people who might be watching hockey for the first time during the WWC. That raising the ball from close range into the legs or body of an opponent is always an offence is very rarely mentioned (perhaps because seeing an umpire penalise a player so hit, which is common, would confuse viewers?). I believe an entirely new approach to ball-body contact is required. The first incident shown in the video clip is from a match played in the 2010 World Cup, so not long after the self-pass had been introduced into mainstream hockey. The incident begins badly, with an absence of common sense and correct Rule application, and then gets worse. The incident begins with an attempted aerial pass by an ARG player. The ball gets to a good height but falls far short of its intended target. It falls directly onto the position of the CHN #5 in free space, there isn’t an ARG player within 10m of her. She opts to control the ball as it nears the ground instead of taking it with a horizontally presented stick and makes a mess of doing that , so that she has to move her feet and turn her body as the ball bounces on the pitch and it then runs away from her as she plays it with her stick. An approaching ARG player (who could not have seen any ball-body contact from her direction of approach) puts her hand up in appeal and the umpire penalises the CHN player – presumably because she though there was a ball-body contact (she too could not have seen any such contact because the body of the CHN player was between her and the ball). The view from the camera angle shows that there was in fact no ball-body contact by the CHN player. But even if there had been, in these circumstances there can be no justification whatsoever for penalty. There was obviously no intent to use the body to control the ball and no opponent could legally have approached to within 5m of the CHN player until she had the ball in control on the ground – so clearly there could be no disadvantage to opponents if the ball had glanced off her body on the way down to ground. Even if she had intentionally trapped the ball with her foot there would have been no reason to penalise that action, even though that would have been an offence. team has been disadvantaged by an opponent breaking the Rules. (If only umpires took note of that Rule when there are inconsequential touches of ball to foot by a defender in his or her own circle). And the subsequent events are possibly worse because there is a lack of clarity, specifically a lack of necessary instruction in Rule 13.2, which needed the application of commonsense to resolve fairly – but that necessary commonsense was absent. This is not the entire Rule but all the relevant clauses are presented. Can you spot the missing, and necessary, instruction or permission? influencing play, the free hit need not be delayed. What is missing is instruction to the defender caught within 5m of a quickly taken self pass, on permitted subsequent actions. The FIH HRB just presented the above text to umpires and left it to them to sort out what a defender could or should do in these circumstances. This despite the self-pass having been used in the EHL in the previous two years. They must have been aware of the problems, Internet hockey forums were inundated with questions about 1) whether or not the defender had to get 5m from the ball before being allowed to play at it 2) the direction in which a defender could or should retreat 3) What constituted influencing. The answers (opinions without Rule backing) offered, conflicted and were therefore, overall of no help at all. The lettering of the clauses of the current Rule 13 is different, but despite some very significant changes in umpiring interpretation of the taking of a self-pass since 2009 there is no change to the above Rule wording. Only when the newly introduced (enacted from May 2015) shadowing from within the circle is described is there any indication that a defender may engage and make a tackle only when the ball has been moved 5m by a self passer. defending player who can legitimately play the ball. The early interpretation devised ‘on the hoof’ by umpires, was that a defender could not retreat in the direction the attacker wanted to go (which led to attackers taking a self-pass charging directly at the nearest defender ‘winning’ a series of free balls and eventually a penalty corner) and that a defender caught within 5m of the ball by a quickly taken self-pass had to get 5m from the ball before being allowed to contest for it (which also led to attackers running at defenders, who were forbidden to engage them) The direction of retreat ‘interpretation’ was changed (forgotten) within a year, but obliging defenders to get 5m from the ball before engagement was permitted lasted substantially longer than that in some locations before gradually fading away. The CHN player in the above video was penalised with the award of a penalty corner to ARG because she did not at any time get 5m from the ball. The facts that the first attempt by the CHN player to tackle was made after she had retreated in front of the advancing ARG player at least 7 metres and that the ARG player had moved the ball about 10 metres when the CHN player made her successful tackle made no difference at all in this particular interpretation. The CHN player requested video referral concerning the award of the penalty corner but was still upset about being penalised for a foot contact she (rightly) insisted did not occur, but the umpire informed her that there was nothing she could do about that because it was the other umpire’s decision (This was untrue, there was no reason the umpires could not have conferred to get things right and order a restart with a bully – Block must have known her colleague’s decision made no sense at all and was unfair. She could even, for the sake of fairness, have been correct about the taking of the self-pass by the ARG player: the ball was not made stationary before the self-pass was taken and it was not taken from within playing distance of the alleged offence – which gave the ARG player an unfair advantage – the CHN was denied the opportunity to move 5m from the ball before the self-pass was taken). Unfortunately, I have lost the soundtrack to the video, but the umpire then ‘fed’ to the CHN player (who did not understand English very well) the question she should put to the video umpire, which was – “Was the CHN player (at any time) 5m from the ball?” The video umpire of course rejected the referral based on that question (as the umpire must have known she would) and confirmed the penalty corner. The second incident in the above video clip shows an ESP player obstructing a NZ player (which was ignored) and the NZ player being penalised, presumably for making contact with his stick while trying to tackle. The ESP self-passer then charged the NZ player with the ball and deliberately played it into his feet (a Forcing offence at the time) The NZ player was penalised again, maybe because of his direction of retreat, maybe because he did not get 5m from the ball, maybe for the ball-foot contact. He didn’t know which or understand what was going on. Who could? He should not have been penalised at all. The video clip above shows a self-pass incident in which the defender was penalised for “not 5m” but I think that under current interpretation the umpire would have seen no offence. The defender shadowed the self-passer for the last meter or so, but did not make any attempt to play at the ball until it had been moved 5m (was in the circle). So everything is okay now. Right? No, far from it. The Rule wording about what a defender caught within 5m of the ball when a self pass is taken, must or should do, has not changed since 2009 (i.e.there isn’t any) only the interpretation has (where have we seen that phrasing before? In the Obstruction Rule which has been interpreted out of existence.) there is still no clear written direction for the defending player to follow, unless shadowing from within the circle. If the FIH Umpiring Committee and the FIH Rules Committee liaise and agree on the interpretations of the Rules, as they both declare they do, why do the Rules of Hockey not reflect the results of this liaison? Rule 13.2. was substantially amended in mid 2015 but none of the current interpretation of the permitted actions of a defender caught within 5m of the ball during a self-pass is included in that amendment. It is just ‘known’ to umpires. I would like to see an early taken self-pass (a self pass taken before retreating defenders have been given any opportunity to retreat – never mind get 5m from the ball) treated as an advantage played (because that is what it is – there is no other reason to take a self-pass early but to gain an advantage from doing so) and for defenders in these circumstances to be permitted to engage the self-passer as soon as the ball is moved (the umpire need only ensure that defenders genuinely quickly retreat as soon as they are aware their team has been penalised, by penalising players who make no attempt to move away from the ball and/or the place of the offence when a free is awarded against them. This would be easier than judging whether or not various 5m restrictions had been observed by players from both teams. The introduction of a second whistle to restart play would be an aid to fair play). A player positioned on the goal-line causes danger. Aerial Rules do not apply to deflections. Aerial Rules do not apply to shots at the goal. Two* of those statements are partially true, but they are true only if the ball is not propelled towards a defender in a dangerous way: the others are false. All of them have been applied by umpires as if they are written into the Rules of Hockey, without any such thing ever having been written in the Rules. But how can we tell what the FIH Rules Committee and the FIH Umpiring Committee have agreed about concerning the interpretation of the Rules when they don’t tell us in writing in the rule-book? Are we to somehow absorb and know ‘interpretation’ by seeing ‘practice’? Cart before the horse. It is not sufficient that umpires know the Rules, it is a Rule that all participants are aware of and abide by the Rules. The FIH need to facilitate the required awareness. This is from the Indoor World Cup in its concluding stages. The only thing of interest in the first fifteen minutes of this match, which was otherwise about as fascinating as watching paint dry, was a blunder by an umpire who does not understand the ball body contact Rule. He immediately blew the whistle following a ball-foot contact without waiting (less than one second) to see if there was an offence, which in this instance, because the contact was obviously unintended, could be the case only if the AUS team gained an advantage from it. The ball, following the deflection off the AUS player’s foot, went directly to a GER player who put it into the goal, but no goal could be awarded because the umpire had already intervened by blowing the whistle and incorrectly signaling for a penalty corner – incorrectly because there was no offence by an AUS player – because there was no advantage gained by the AUS team – advantage went to the GER team – so the Advantage Rule should have been applied..
How should he have restarted the game when there was no offence and it was the fault of neither team that he blundered? Should the GER team have been ‘compensated’ for his blunder by being awarded a penalty corner? No of course not, no more than the AUS team should have been penalised with a penalty corner for a ball-foot contact that was not an offence. The umpire tried to ‘make up’ for the blunder (or though he was doing the correct thing), by continuing with the penalty corner award instead of correcting it. To be correct he had no choice but to order a bully restart, no matter how embarrassed he may have been by his mistake. Am I being too critical? No, I don’t think so: this was a tournament to determine which team was to be the champion of the world – world level Rule knowledge and self control by umpires must be expected at such events, not novice level blunders – and blowing the whistle the instant a ball-foot contact is seen is a novice level blunder. It almost goes without saying at present that throughout the match both umpires appeared to be unaware of the existence of the Obstruction Rule. Those who disagree with me about this incorrect award of a penalty corner in these circumstances should bear in mind that I did not write the ball body contact Rule or the Explanation of application provided with it – the FIH Rules Committee did so of course – but I have read it and I understand what I have read, these people could do the same: two wrongs do not make a right.